President Omar Hassan al-Bashir said on Saturday Sudan’s next constitution would be “100 percent Islamic” to set an example for neighbouring countries, some of which have seen religious parties gain power after popular uprisings. 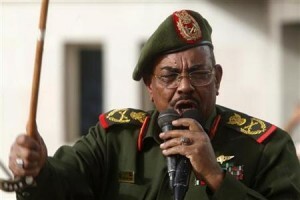 That appeared to be a move to assuage resentment by other opposition parties – many of which are still dominated by Islamist figures – over Bashir’s reluctance to loosen the grip of the ruling National Congress Party. However, they have not yet sent their supporters out to the streets. And we tell non-Muslims, nothing will preserve your rights except for Islamic sharia because it is just,” he said. THIS IS LOVE AND PEACE AND FREEDOM these radicals bring. Live in the dark and control the people while you sleep with pros, drink and smoke hash behind closed doors..Steal and kill your people. I can feel the love, it,s like a ray of sunshine on a cloudy day…. i still don’t get how he is still free? was’t an international tribunal found him guilty of genocide? “100 percent Islamic” … well, Omar’s version anyway … going to be a wonderful place to live.